The controversy surrounding 2017's A Dog's Purpose – which was accused and cleared of animal cruelty after footage emerged of a distressed German Shepherd – didn't stop it mustering an audience of fans. A follow-up, A Dog's Journey, is released later this year; A Dog's Way Home arrives first, and with a similar pedigree. From the same author, 'petsploitation' specialist W Bruce Cameron, standalone story A Dog's Way Home offers an equally commercially-minded mix of cuteness and sentiment. The titular route is from New Mexico to Denver, Colorado, and the traveller is a pit bull mix called Bella – her inner-monologue voiced by Bryce Dallas Howard. Bella is trying to get back to her owner, dapper animal rescue volunteer Lucas (Jonah Hauer-King), who has taken her down south to stop her from being put to sleep by corrupt authority figures. Bella's love for Lucas sends her homeward bound, and she encounters wolves, a fake-looking mountain lion, war veterans, a gay couple and various natural phenomena on a picaresque voyage of enlightenment. Disney's 1963 live-action drama The Incredible Journey seems to be the specific template for this latest doggy odyssey, that comes complete with a social conscience. Charles Martin Smith has form in the field, directing the lightweight Air Bud and A Dolphin's Tale, and he's on familiar ground here. 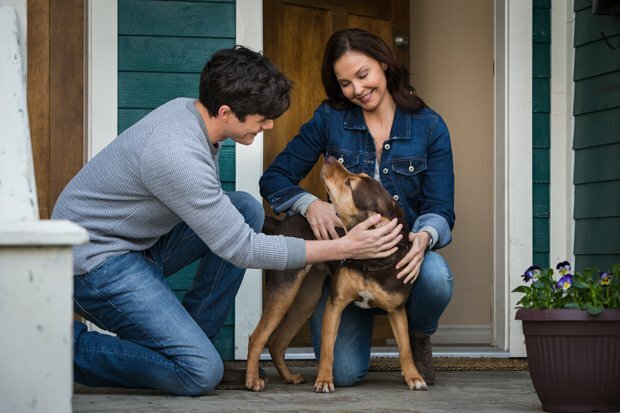 Despite a few dark turns, A Dog's Way Home eschews the reincarnation structure that gave A Dog's Purpose such a morbid tone, instead it sports a sunny disposition that reflects Bella's own genial outlook. Cannily released amongst the high-minded awards season entries that can leave general audiences scratching their heads, this is simple, shamelessly manipulative fare for children of all ages. Those who like animals and a good cry need no more encouragement to share in Bella's adventures.